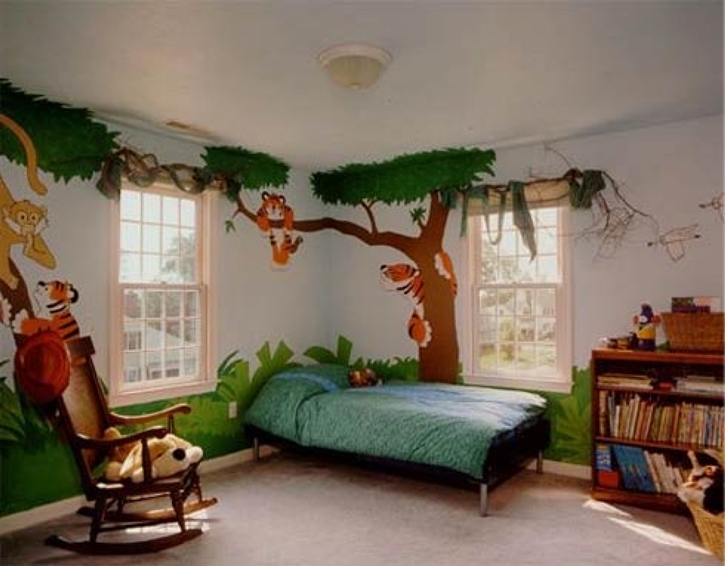 Step 1- Start with painting the theme on the kid’s bedroomswalls, or get a mural made, paint landscapes, do anything to give it the feel of a rainforest. Make it look as real as possible. You can even try painting an emergent layer, or paint on the ceilings a dense canopy of layers of tropical rainforest tree tops, with dashes of sky peeping in between the leaves. Beneath than make a canopy layer of the similar leaver, only a little denser as they grow less in less of sunlight. The area beneath that should be shadowy and dark form the shade of the tree leaves. Here you can have small shrubs or young looking trees. The ‘forest floor’ of your room could bear the imprints of decaying fruits and leaves. To complete the background of your mural pain the sky carefully. The uppermost region of the kid’s room décor could be fine blue color, within the color gradually fading to light green and finally darn green in the lower areas of the sky. Do it artistically, with good shading (do not make dark borders), and complete the look of the forest sky. Along the wall section’s middle third area, you can draw and paint simple trunks of the trees. This should precisely be ending at the top layers bottom with its vase. Where the top of its trunk ends, you can draw treetops, and your tree is complete! Leave some part of the sky visible as you paint the tops, at the top of the trees you can get s few small plants painted. Step 2: for baby room decorations you can add some animals to this mural. In the uppermost area paint birds, insects, etc, with snakes, reptiles, and mammals such as the monkeys in the canopy region. On the foot of the trees draw a few other jungle animals. However, do not cluster the whole region with too many animals since this may ruin the effect. Step 3: give the mural a three dimensional effect, by affixing some animal toys to the wall. Instead of curtain rods, let taught ropes adorn the curtains. Step 4: you can get small room fountains, live birds, etc or keep some CDs handy when you might what the room to send like a rainforest. Step 5: however in spite of all the rainforest affect you mange to create successfully, make sure the room remains livable. 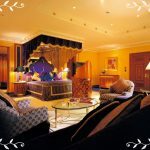 Get bedding andchildren’s bedroom furniture that goes with the theme, but do not sacrifice on the comfort. Get bedding in the right design and colors, to get the right effect for the baby room décor in the jungle style. Let your imagination run wild, and try out new stuff, to make it all the more fun!